An artist's concept of Kepler-186f, an Earth-size planet found orbiting in the habitable zone of its parent star. A planet like Kepler-186f with a smaller orbit than Earth's could be at risk of having only one hemisphere face toward the star, with the other hemisphere always facing away. Alien planets that orbit close to their parent stars may be at high risk of the ultimate hot-cold scenario, with one side stuck in permanent daylight while the other shrouded in everlasting night. But a thin atmosphere may be enough to save a planet from this fate, new research shows. Living on a planet with one side in perpetual sunlight and the other in perpetual darkness would pose some significant challenges for survival — the sunny side of the planet might reach boiling temperatures while the dark side might be completely frozen. However, new research by scientists at the Canadian Institute for Theoretical Astrophysics (CITA) shows that exoplanets with Earth-like atmospheres may have the right ingredients to avoid the fate of synchronous rotation. Synchronous rotation is also known as tidal locking, because tides are at the heart of why these orbits arise, the researchers explain in their paper. The moon's pull on the Earth creates tides in the ocean — in turn, the Earth exerts a tidal pull on the moon. The tidal force slows down the rotation of the moon (or planet), until it is synchronized with the body's orbit. Because tidal forces are stronger at shorter distances, synchronous rotation tends to happen to bodies that orbit close to their parent body. Earth is not at risk of falling into a synchronized cycle because it lies too far away from the sun. Some researchers have theorized that the reason Venus does not experience synchronous rotation is because of its thick atmosphere. Planetary atmospheres are not totally spherical — they can move, shift and bulge in some areas. As the atmosphere shifts, its mass exerts a force on the planet, and computer simulations show that this atmospheric force can be enough to counter the frictional force of the tides, potentially stopping the planet from falling into a synchronous rotation. A thick, heavy atmosphere like the one found on Venus could exert a rather significant force on the planet — but could an atmosphere 100 times less massive, like Earth's, do the same? "The main surprise that comes out of their work is that if the Earth were in Venus' current location, the effect of [Earth's] atmosphere, while a hundred times less massive, would be almost ten times as strong as the effect of Venus’ atmosphere," Jeremy Leconte, a post-doctoral fellow the CITA and an author on the new paper, wrote in an email to Space.com. The reason has to do with the heating of the planet's atmosphere. Differences in temperature generate strong winds that redistribute the atmosphere, distorting it in such a way that it tends to counter the drag of tidal forces. As for exoplanets, Leconte writes, "While astronomers are still awaiting observational evidence, theoretical arguments suggest that many exoplanets should be able to keep an atmosphere as massive as that of the Earth." "In that case, this new study shows that a large number of known terrestrial exoplanets should not be in a state of synchronous rotation, as initially believed. Thus, they would have a diurnal or night/day cycle like on Earth. The duration of their days, however, could last between a few weeks and a few months." 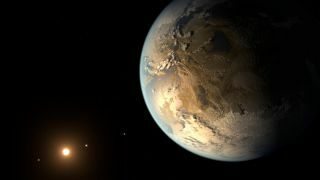 The researchers say their results also create scenarios where a planet like Earth would still become tidally locked, so the findings do not predict the fate of every Earth-like exoplanet with a short orbit. But the results do provide another bit of hope that life is surviving elsewhere in the universe. The study is detailed online in the Jan. 15 edition of the journal Science.